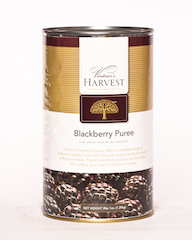 There are many ways to make wine with the purees. It comes down to personal preference. 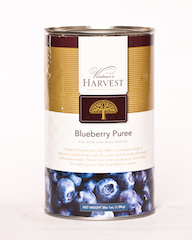 Vintner's Harvest Fruit Purees one gallon recipe (see chart) calls for one can of puree with enough sugar to bring the original gravity to 1.090 or higher. This produces a wine with an alcohol level of 12% by volume and will remain stable for a long time. To make a fruit wine comparable to using a 96 oz. 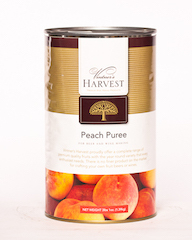 can of fruit base, use two cans of Vintner's Harvest Fruit Puree per five gallons and enough sugar to bring the gravity to 1.090 or higher. Add natural fruit flavoring enhancers to bring out flavor and give more aroma. Add sugar gradually both initially and for sweetening. Add 1/2 the initial sugar and take a gravity reading or taste if you are sweetening a finished wine before adding the rest. This will ensure that your wine does not come out too strong. Fermentation will stop automatically, but wine must be stabilized with potassium sorbate if sugar is added after fermentation for sweetening. This will prevent renewed fermentation. The amounts of acid blend, yeast nutrient, white (table) sugar, and grape tannin vary depending on the fruit. Apricot: 1-1/2 tsp. acid blend, 1 tsp. yeast nutrient, 1-1/2 lbs. sugar, 1 tsp. pectic enzyme, 1/4 tsp. grape tannin. Blackberry: 1/2 tsp. acid blend, 1 tsp. yeast nutrient, 3/4 lbs. sugar, 1/2 tsp. pectic enzyme, no grape tannin. Blueberry: 2-1/2 tsp. acid blend, 1 tsp. yeast nutrient, 2 lbs. sugar, 1 tsp. pectic enzyme, no grape tannin. Cherry: 1-1/2 tsp. acid blend, 1 tsp. yeast nutrient, 1-1/2 lbs. sugar, 1/2 tsp. pectic enzyme, 1/4 tsp. grape tannin. Peach: 1-1/2 tsp. acid blend, 1 tsp. yeast nutrient, 1-1/2 lbs. sugar, 1 tsp. pectic enzyme, 1/4 tsp. grape tannin. 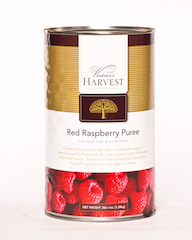 Raspberry: 1/2 tsp. acid blend, 1 tsp. yeast nutrient, 1-1/2 lbs. sugar, 1 /2 tsp. pectic enzyme, 1/4 tsp. grape tannin.